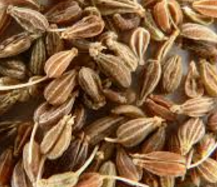 Aniseed is consumed as the fruit or seed from the flowering plant, Pimpinella anisum. This herb is known for licorice-like flavor and different medicinal purposes, especially as a digestive aid. This is widely used as an important ingredient in various foods from baked ones to liquors traditionally as well as in the modern times. It is a good source of micronutrients and minerals like minerals like calcium, iron, copper, potassium, manganese, zinc and magnesium. Due it its antiseptic, anti-spasmodic, carminative, digestive and stomachic properties it has a wide use in traditional medicines too. Its consumption is very healthy and results in the production of RBC’s and also control heart rate and blood pressure. What is Aniseeds root Called in Hindi and Other Indian Languages(Regional)? In English they know it as Aniseed, it is commonly known as Valaiti Saunf / Aawonf in Hindi, in Tamil and malayalam they call it as Shombu, in Telugu it is known as Kuppi Soptu, in Kannada it is called Sompu, in Bengali it is called Muhuri / Mitha Jira, in Gujarati they call it Anisi / Sowa, in marathi it is called as Badishaep, in Oriya it is called Sop and in punjabi they call it Valaiti Sounf.